Now we’re going to look at drawing a triangle with Managed DirectX (MDX 1.1) using C#. The material presented here will strive to be the equivalent of the last tutorial which was in C++. 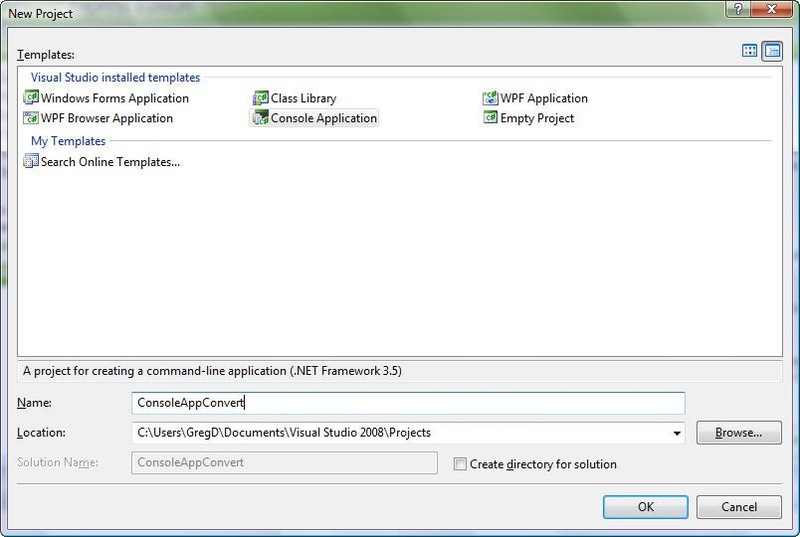 The tutorial sample code was built and tested on Visual Studio 2008 Express. However, the code should work with 2005. You’ll also need the DirectX SDK August 2007 or earlier. I use June 2007 – you can download it with this link. Everything involved with setting up the project, form, and DirectX will not be covered in this tutorial since it was already explained last time. See the “Managed DirectX C# Graphics Tutorial 1” if you want details on that. In this post we’re going to take the code from the last tutorial and build off of it. We actually only need to change one function – OnPaint(). If you have the last tutorial’s project open, you can delete the contents of OnPaint. We’re going to replace those lines with stuff from the next section. Unlike using DirectX in C++, there’s no need to define your own FVF vertex structure. Managed DirectX has pre-defined vertex types. The one we need to use in order to draw our triangle is represented by the “TransformedColored” struct. This struct is a nested entity inside the CustomVertex class. The CustomVertex class contains many struct’s representing common fixed-format vertex types. Basically, different vertex types that you’d commonly need to create using FVF codes in C++ are already defined by Managed DirectX. There’s also no need to create a vertex buffer object like you would in native DirectX. You can use the original array of vertices and pass them directly into drawing routines. However, MDX still has the ability to work with vertex buffer objects if you need them. The first line creates the vertex array while the next six lines fill in the information at each vertex (position and color). Then Clear() is called to erase the background. BeginScene() starts the 3D drawing code just like in C++. We tell DirectX about the vertex type being used by setting VertexFormat. This must match the vertex array element type. DrawUserPrimitives() takes the vertex array and renders the triangle. Finally we end the scene with EndScene() and show everything on the screen with Present(). What could be easier? Look familiar? If it does, good. We set out to create the C# .NET equivalent of the C++ tutorial and did exactly that. If it looked different from last time, then we’d have a problem. I hope you’ve gained insight into the differences and similarities of native DirectX versus Managed DirectX. If you have any questions or comments, please don’t hesitate to email me or leave a comment on this post. I’m going to demonstrate the same principles as my last post (DirectX 9 C++ Graphics Tutorial 1), how to fill a form with a solid color – except this time it’ll be in .NET using C# and Managed DirectX (MDX 1.1). MDX 1.1 is meant to expose most of the functionality as native DirectX 9. Everything in this tutorial is based on Visual Studio 2008 Express. You’ll also need the DirectX SDK. You can download it from Microsoft’s site with this link. Note that this is the June 2007 release. I purposely didn’t link to the latest (November 2007 at the time of this writing) because Microsoft has removed the Managed DirectX samples and documentation from that release. If you read my last post, then you know that Microsoft has moved MDX’s functionality into the XNA framework, but threw out all features which were not simultaneously supported by both Xbox and Windows. We’re going to start from absolute scratch – that means no wizards and no auto-generated code. 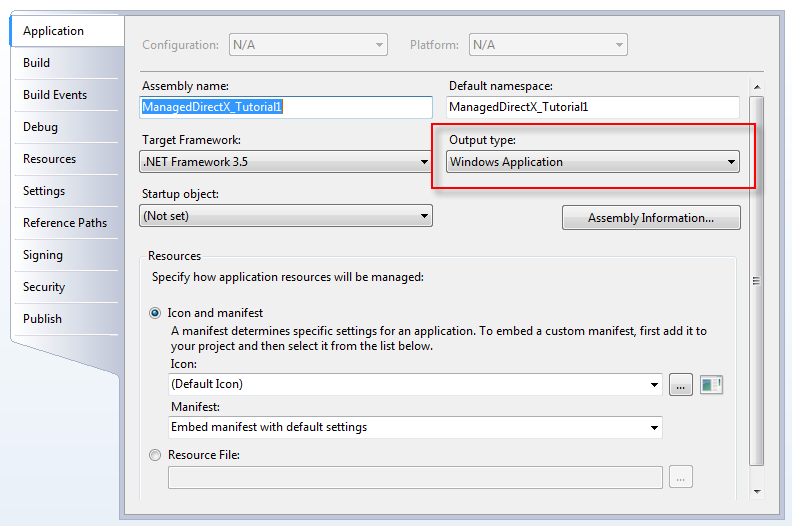 So start out by creating an empty C# project. You can name it whatever you like and place it in any directory. Add one source file called “main.cs” (actually, you can use a different name but I’m going to refer to this file as “main.cs” throughout the tutorial). For the adapter we used “0” since this designates the default. We chose hardware rendering as opposed to software emulation. Our main application class is also our render target form (hence the “this” keyword). We wanted software vertex processing instead of hardware calculated transforms. Lastly, we passed in our “present_params” object as the fifth parameter. The “Clear()” function fills one or more buffers with a single value. The first parameter specifies which buffer, or series of buffers, to fill. It can be the rendering target buffer (Target), depth buffer (ZBuffer), or stencil buffer (Stencil). You can specify more than one by combining their values via a bitwise “OR” operation. The second parameter specifies what color to use in clearing the render target surface. In our case we chose blue. The third parameter specifies what value to use for clearing the depth buffer. Lastly, the fourth parameter specifies what value to use for clearing the stencil buffer. The “Present()” function displays everything to the screen. It is equivalent to calling the C++ version with four NULL parameters. While this program is rather boring, in the next tutorial we’ll cover how to draw a 2D triangle with different colored vertices. Can I Use Typedef’s in C#? using GLfloat = float; // ERROR! This line results in a compile error because “float” is a keyword. Why weren’t C# aliases built to support this as well? When you consider the original purpose of aliases it kind of makes sense. They were meant to save the programmer from lots of typing by providing a mechanism to shorten long qualifiers. We all know some namespaces and classes in C# are much longer than what you would typically see in a C++ program, so providing renaming support was practically a necessity. But do you really think a lot of programmers are going to shorten “float” or “int”? So when I said you can “get pretty close” to a C++ typedef, I was specifically referring to limitations such as this. Another big limitation is that aliases are limited in scope. Only the namespace in which they’re declared can see them and their scope cannot cross multiple source files. The last part is severely limiting – it forces you to include the same declaration in every file. At least it’s better than nothing. Most C++ programmers know how to start coding from an empty project without the wizard’s assistance. But how many tutorials show a way to do this in C#? Questions arise like what references you need, what should the default project settings be, etc. In this post I’m going to create a Windows Form application starting from scratch (just an empty project). It’s actually quite easy if you’re making a DLL, Console application, or Forms application. 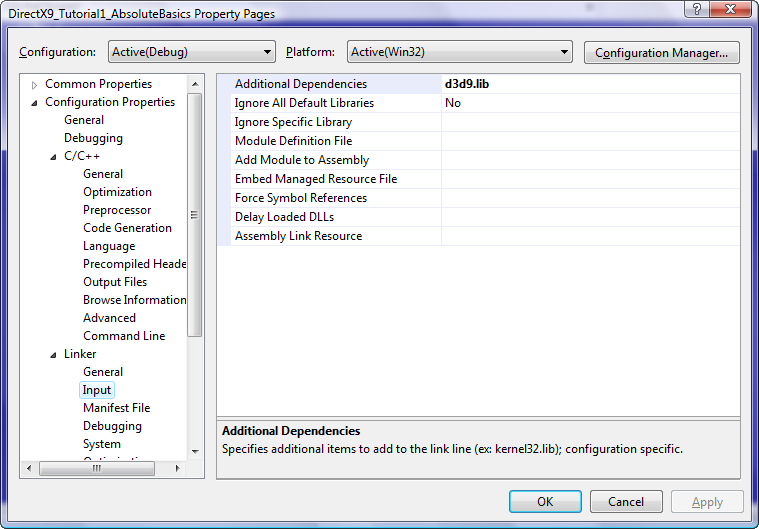 Plus, you can be certain that your application doesn’t contain any useless references or dependencies. Note: this tutorial is applicable to Visual Studio 2008. 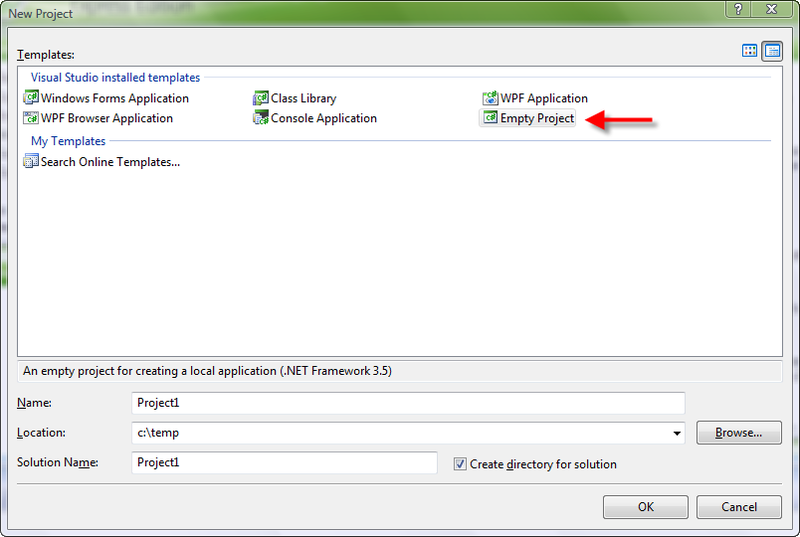 Start Visual Studio and select “File->New Project.” When the “New Project” dialog appears, select the “Empty Project” template and name it whatever you like. Click OK.
At this point you’ll have an empty project loaded in Solution Explorer without any source files or references listed. 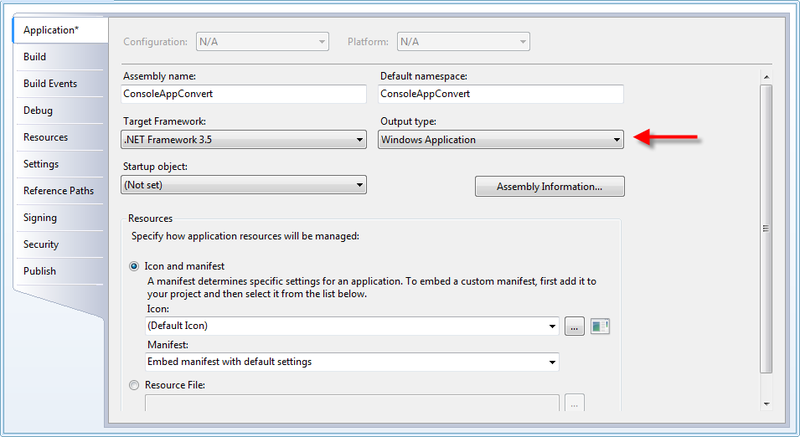 Now, go to the “Project” menu and select “Properties.” Under the “Application” tab, click the “Output type” combo box and change it from “Console Application” to “Windows Application.” This makes the project into a regular Windows Form app. 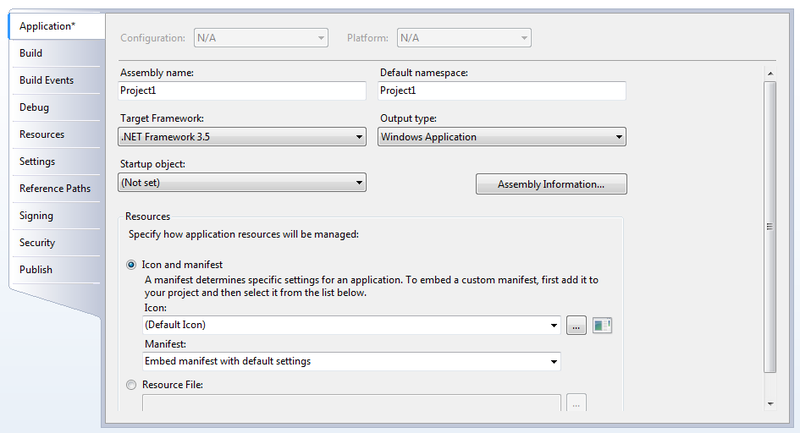 Save this configuration (hit CTRL-S or click “File->Save”) and close the “Project Settings” window. FYI: for almost any project you’ll at least need the “System” reference, so I add this one right away no matter what kind of project I’m creating. If your project was extremely simple, had no dependencies, and you didn’t care about fully qualifying your types, then you could get away with not adding this reference. You’ll notice from the last screenshot that we don’t have any source files in our project. Well that’s easy to fix – click on “Add New Item” located under the “Project” menu. When the “Add New Item” dialog appears, select “Code File.” Name it whatever you like and click OK. In that namespace type a class declaration deriving from “Form”. Type a “static void Main()” function into the class. You can actually compile and run the project in this state, but it will just produce a blank form and you won’t be able to add controls in the Designer. We’ll take care of this problem in the next step. You may be wondering how to associate your hand-written code with Visual Studio’s Designer. Believe it or not, there’s no need to do this. In fact, Visual Studio automatically detects whenever you derive a class from “System.Windows.Forms.Form” and links the associated source file to the Designer. Congratulations! 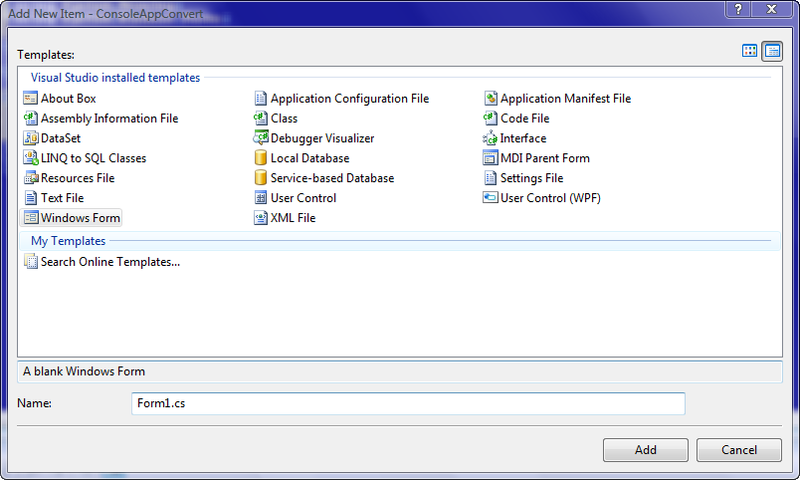 You just created a Windows Forms application from scratch! You may be thinking, “but what about the extra code the wizard adds in forms like Dispose() and the “components” member? Don’t I need that stuff too?” The short answer: it depends. In certain situations you’ll need the “components” member, but it’s not necessary to define it. The Designer will add the declaration when it’s needed. Try placing a Notify Icon or Timer control and you’ll see what I mean. The “components” member is used for most of the non-visual controls available in the Designer. If you drag a control on a form and it gets added to the container bar (on the bottom of the design window) instead of making some visual appearance on the form itself, then there’s a good chance it’ll use this variable. You’ll need the Dispose() function only if you must explicitly free resources that can’t otherwise be managed by the Garbage Collector. These resources might be unmanaged memory, file handles, database connections, or similar objects who’s destruction is non-deterministic. Given that our example program allocated objects only from the managed heap, having a Dispose() would be pointless. I hope that this post has given you insight into rolling your own Windows Forms project from scratch. While it will always be faster to use the wizard, at least now you don’t have to rely on it. You also know what parts of the wizard’s code can be deleted if your program doesn’t require it. How many times have you had a project (or solution) in Visual Studio’s MRU list that you didn’t want? Maybe it was a project you opened by mistake, or maybe it was something you only needed in rare circumstances. Whatever the reason, did you also try looking for an option in Visual Studio that would allow you to delete those MRU entries? I’ve been in the same situation and, unfortunately, I had no luck finding a way to delete a specific entry in the list. At least, not directly through Visual Studio. In this post I’ll show you a hack that will allow specific entries to be deleted. It requires a few registry modifications and isn’t the cleanest solution, but at least it gets the job done. 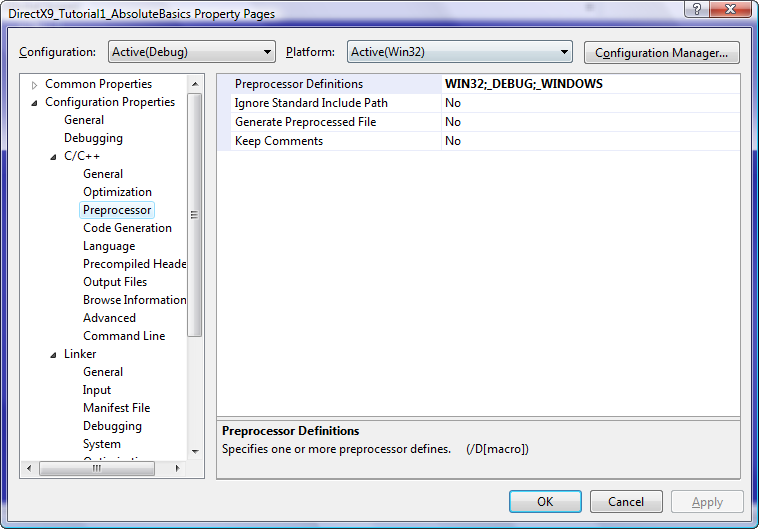 If you know of another way to do this directly through Visual Studio then, by all means, please leave a comment. Here you’ll see paths to each of your MRU projects. 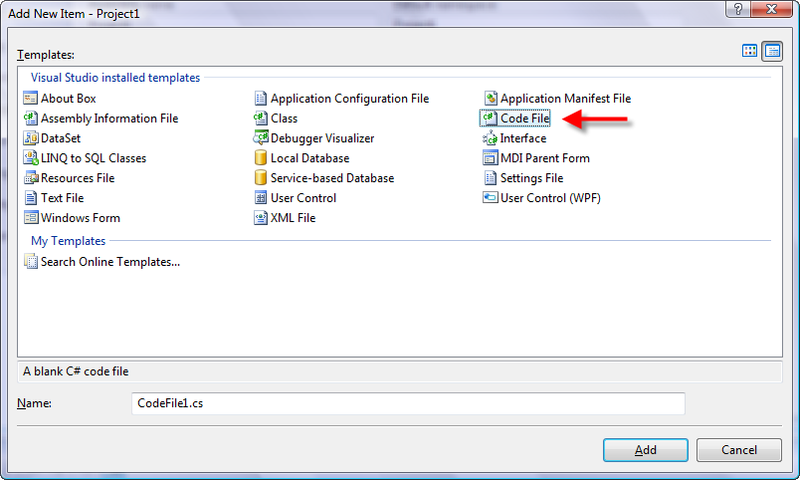 The entry which appears first in Visual Studio’s list is labeled “File1,” the second is “File2,” etc. Simply delete whichever entry holds the path to the project you don’t want. If you’re deleting the last entry, you can stop here. Otherwise, you’ll have to rename all successive entries such that the numbering is consecutive. As I promised in yesterday’s post, I’m now going to show you an even easier way to convert a C# console application into a regular Windows application. Since the steps are nearly identical, I’m just going to focus on the key points instead of writing the same thing as before. Create a regular C# console application or open one of your own. Remove the “args” string array parameter from the Main() function. Add “Application.EnableVisualStyles();” as the first call in the Main() function. Add “Application.Run(new Program());” as the last call in the Main() function. Change the form’s size in the Designer. Go back to the source window of Program.cs. You’re done! 🙂 Everything is contained in this one source file. The designer will keep on modifying “InitializeComponent()” whenever something changes in the form itself. 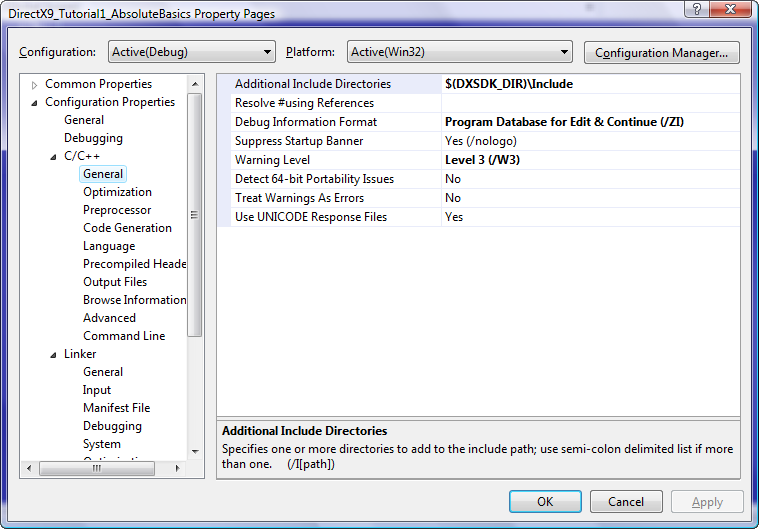 It will also add the necessary member variables to the “Program” class whenever controls are placed on the form. This is an extension from my previous post on C++/CLI marshalling. In this segment I’m going to talk about sending an object from managed code to native code. While doing this kind of marshalling is required less and less these days as we depend more on external .NET components instead of COM DLL’s or native C API’s, there may still be times where you’ll need to do it. I put both the class definition and the prototype of SomeNativeFunction() into a header file called, “NativeSampleAPI.h.” This header will used in the managed project so it can have access to the library’s type(s) and function(s). Now we will create a C++/CLI project using the following wizard template: “CLR Console Application.” The first step is to create a managed class who’s layout exactly matches the native class’s layout byte-for-byte. For simple types such as int’s and char’s, choosing the correct managed type to match the corresponding native type is easy – in C++/CLI the native type “char” matches managed type “Byte,” the type “int” matches “Int32,” etc. However, for non-intrinsic types, choosing the equivalent can be confusing – how do you deal with an array which has an arbitrary size, or a string that is ANSI instead of unicode? The “MarshalAs” attribute applies to the member immediately following it. It accepts either a short or an “UnmanagedType” enum as the first parameter telling the compiler exactly which native type to use. If you need to specify more information about the type, such as fixed string length or array size, you would then fill in a series of named parameters following the first. For example, it’s not enough to tell the compiler that “m_float_array” is an array – it also needs to know the array size and the native type of each element. That’s where “SizeConst” and “ArraySubType” come into play. “SizeConst=3” tells the compiler that “m_float_array” is an array of fixed size and the number of elements it contains is three. “ArraySubType=UnmanagedType::R4” tells the compiler that it’s a “float” array (a “double” array would have been specified with “R8” instead of “R4”). Let’s go through things line by line (not counting print messages). First we create an instance of NativeObjectEquivalent, our managed version of the native class, via gcnew. Then AllocHGlobal() is called in order to allocate a chunk of memory from the unmanaged heap. It’s important that the memory is not on the managed heap so we’re ensured the pointer will never move (managed pointers can have their address changed during heap compaction). At this point we call StructureToPtr(). This function marshals a managed object into an unmanaged block of memory pointed to by the IntPtr. Finally, we call our library function converting the IntPtr into a native void pointer via the ToPointer() call. We must cast the void pointer into a NativeObject pointer to satisfy the compiler. This post, of course, only scratches the surface on the many different types of marshalling that can take place. Hopefully it has given you a good starting point for figuring out more advanced marshalling by yourself. If you have any questions or comments feel free to send me an email via my Contact page. *Get new posts automatically! Subscribe via RSS here. Want email updates instead? Click here.